DGU: A Cynical Tale, Classic RPGs go sad. Live on Kickstarter! New Trailer! 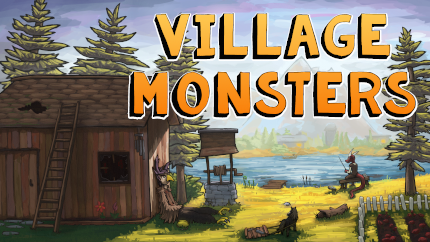 TIGSource Forums Community DevLogs DGU: A Cynical Tale, Classic RPGs go sad. Live on Kickstarter! New Trailer! 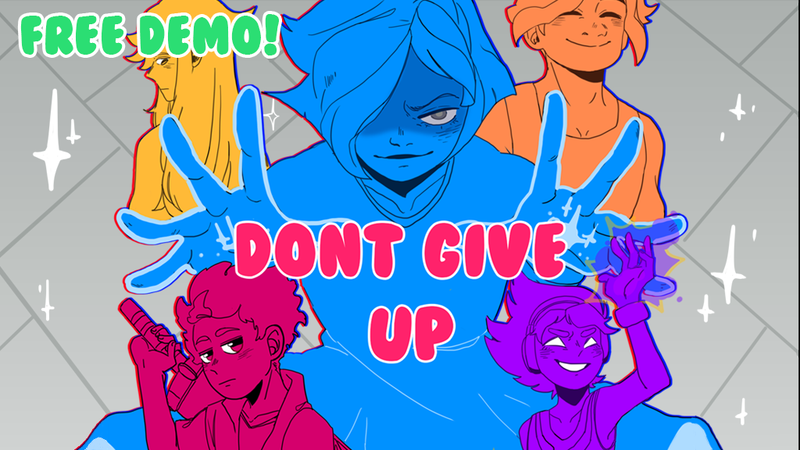 Don’t Give Up: A Cynical Tale is the sassy comedic tale of Tris, an anti-social, cynical game developer and his quest to confront his inner demons. Balance the hilariously dysfunctional tragedy that is your social life all while facing off with the phantoms of your inner conscious and those that would claim it. DON'T GIVE UP: A Cynical Tale is the official name and reinvention for the title Cynical 7 I've been working on and it features a new battle system and story telling. The uses an ebb and flow between the player and the enemy, where the player has a defend phase where they can do things like earn buff and deal light damage, and then an offensive phase where they have a certain amount of time to freestyle and dish out combos to the enemy! Here's a peek at the battle UI! I like what I see. The art style of Earthbound + Pokemon apparently had a lovechild, and it's called Cynical 7. Awesome art style! And I like the idea of Boss Battles only (hey, my game is like that, too! Except Boss Conversations only)! Is the 7 referring to 7 playable characters?! Hello all! Today it’s time for my first update! I announced my search for a coder on Friday and have already gotten 4 bites, 3 of them are local, if I managed to work something out with someone here it would be HUGE and I have no doubt it would ABSOLUTELY 100% speed up my motivation and development process, so let’s hope for the best! I really like the new characters design! They're quite unique, something really tough to do with humans, IMO. Yay new screenshots! It's been a while since my last update and I've been working on Cynical 7 all this time! Tomorrow be prepared for my first official reveal of the game's battle system! It is a fun, coordination intense real time battle system! The biggest thing is that I've found a coder through TIG and we are weeks away from Cynical 7's first polished demo! 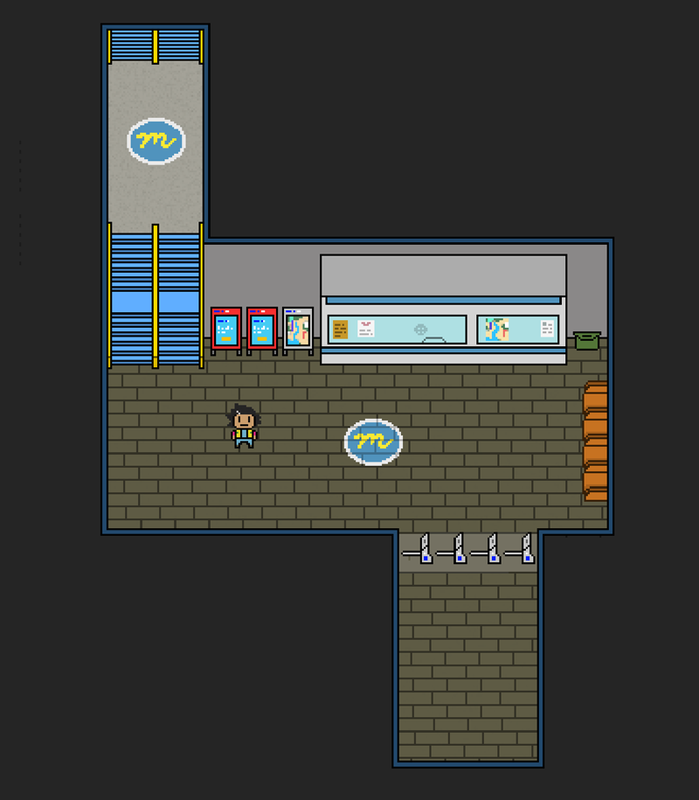 Threeson is now full of bustling streets to explore full of people, an accessible underground subway with trains, and tasks for uninspired game dev to accomplish! Fun assortment of cars and people cruising through the city streets! Going forward next week will be spent cleaning up the battle system and then implementing the rest of the narratives for the demo! I'll spill the beans on battle tomorrow and then after that I hope to focus more on sharing some narrative with you guys! Have an awesome rest of your Friday and as always if you're digging the game please consider checking me out on social media! Always super interested in your thoughts and feedback! Woohoo! It's finally here! The combat reveal! Combat in Cynical 7 will flow in real time, as a kid, grinding your characters to insane levels and power was really fun for me, working tirelessly to be able to overcome bosses without breaking a sweat. However as an adult I realized this wasn't fun at all, and I'm more interested in the story and meaningful conflicts. I used this as the basis for developing the battle system. Cynical 7 has no generic counters, only boss battles that will test your skill and constantly require you to evolve your level of play. The Action Zone: The action zone is where all the magic happens, it consists of 4 panels the player can hop between to safely launch and avoid incoming attacks. Before an attack is launched the action zone will briefly indicate which panels are safe and which ones are dangerous. Attacking: Tris can use a quick ranged attack that consumes a small amount of energy, or a slower powered attack that consumes no energy but will leave him vulnerable for longer. Enemy Attacks: The enemies in the game will all use giant attacks to try to crush, bludgeon, maim, and eviscerate Tris, the attacks they use will be related to their fighting style and/or personality, as you can see in the GIF, the robber uses daggers! Momentum Meter: The momentum meter was design to emulate the ebb and flow of a fight between two opponents. When someone is winning a fight they are emboldened and their adrenaline rushes and when they are losing, they have to fight harder to get back in the game and avoid being exhausted. The momentum meter is filled by successfully landing attacks and dodging attacks while it is drained naturally over time and by taking damage. The higher your momentum the faster you can move between panels and attack, the lower it is, the slower Tris can act and react. Basically, it's important to do well or even the most harmless of foes can get the jump on you, high stats and fancy weapons can't save any fighter from exhaustion! Bonuses: There are good and bad bonuses that can appear on both the red tiles and the blue tiles, these will be random and the player will have to adapt to them accordingly. Special Meter: Once the special meter is full the player can unleash a devastating attack, the meter is filled by incapacitating the enemy with Dizzy Status and Power Ups. Energy Bar: An energy bar indicating the amount of ranged attacks Tris can execute, refills over time. But if the attacks are telegraphed before they happen wouldn't it be easy just to dodge the enemy and avoid momentum issues? In the beginning yes. But however, random bonuses that can affect your momentum, paralyze, and confuse you could affect situation, not only that, enemies will often quickly attack in quick succession or even telegraph more than 1 attack in advance, so it'll be up to you to remember where the danger is! Between the statuses and any momentum hiccups, you'll really have to bring your A game! Animations for dodging and attacking still need to be polished, every good hero needs a victory pose. All of the meters need to be implemented to a functioning state! If you have any additional questions about the battle system feel free to ask and I'll clear them up! Re: Cynical 7 - Comical Earthbound Style Adventure about a Game Dev! COMBAT UPDATE! One thing I learned in martial arts was to fake telegraph (like do a big wind-up while starting at their chest, then quickly kick them in the head instead). I think it might be fun if there were two moves with very similar wind-ups (or maybe exactly the same up to a point), so you have to watch carefully to know which one, and learn the boss' moves. It sounds like you're trying to make a more "realistic" fighting system with Momentum and whatnot, and although I usually don't care about realism as a standard in video games, I always thought making battle more like actual sparring could be cool (implementing the mental trickery side in addition to hitting hard/fast, etc. ), and in this case it sounds cool! Glad to see you're still working on the game in general! Thanks for the suggestion, I did my best to come up with a battle system that could have a lot of variety going forward, the main things I wanted to avoid was turn based battles (because face it there is a set amount of staleness in it) but I also felt free roaming real time battle was also bringing nothing new to the table. I'm sure some iteration of this system is out there somewhere but I've played a lot of retro games and I can't name any offhand! The sample you're seeing is the first/tutorial battle so there will be a lot of trickiness and variety down the road for enemies! For example an enemy only being able to be hit during a certain phase of their attack cycle and reflecting damage during all others. The momentum system was my way of trying to ensure anyone playing the game has to put in an effort towards playing it, experience points and levels allow the players the ability to stat their way into "easy mode" and free roaming real time might allow more skilled players to defeat the game with one hand tied behind their back. This way, players of all skill levels will have to be engaged and stimulated during battles. I appreciate you keeping tabs on the project! Definitely plan on dropping lots of daily-ish progress on here now that things are really moving! Today's update will be a look at the lore of the game! Today we'll be checking out Tris and the backstory behind his weapon Harutaru. Harutaru is a sword made out of Mechazite, a foreign material that the Astrals use to forge weapons. The sword reacts to the user's own energy and can manipulate its length and size in addition to allowing the user to project their energy in physical form. Tris first encounters Harutaru in a dream, only to discover he's able to call it forth from that point on. He later discovers that this was no miracle and unknown to him, by choosing to continue using the sword he becomes a participant in a game run by the Astrals where his soul and everything in his city is at stake. But Tris isn't all magic swords and beams, he still remembers how to execute a good ol' pimp slap. Next update will either be a demo update or Tris's more in-depth bio depending on how much gets done on Monday! Meters work! Health meter is working as well as the momentum meter, the dizzy meter works as well but does not presently inflict dizzy status! The energy meter is functioning as well! Removing the meters next to the boss! 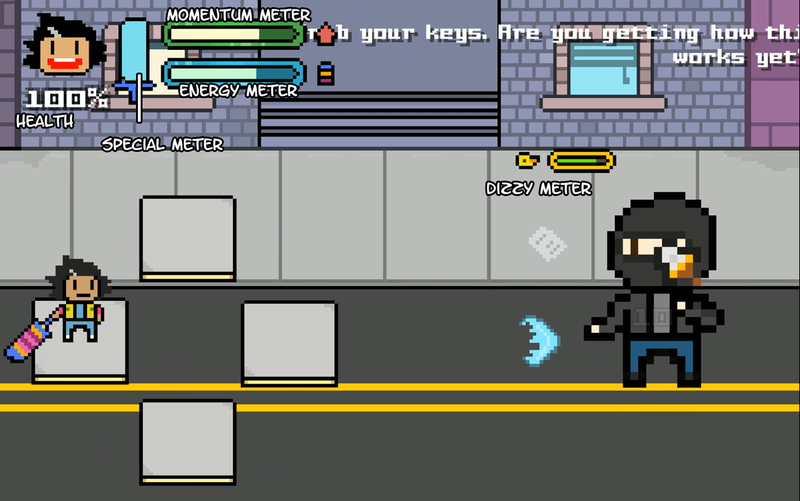 By changing Tris's health display to a % we can put it underneath his avatar and swap it with momentum, since the special meter doesn't need to be maintained or really monitored, this will be compacted into something smaller and more attractive! Another combat update! It's just about at a state that it should be! How do you plan to make the battles distinct from each other? More squares? More weapons? Good question! This is the first battle in the game, there's lots of room for variety and growth, since the game is only going to have boss battles, players won't have to worry about having their head beat against the wall with grindy battles and XP. The pressure to keep your momentum high will ensure the player has to give their all throughout the entirety of each battle! I don't know if it's supposed to look like a rainbow icecream bar, but I like that it does! I like when the character raises it and jacks it up - is that a charging move? OH MY GOD, an ice cream bar weapon, so awesome! that sounds fun as heck, but the games humor is aimed in a more sarcastic humor direction so i fear that would be a turn in the wrong direction! the jacking up motion yes is basically Tris charging up for his ultra attack! A quick update today! The other half of the team is at a convention this week so no new gameplay! 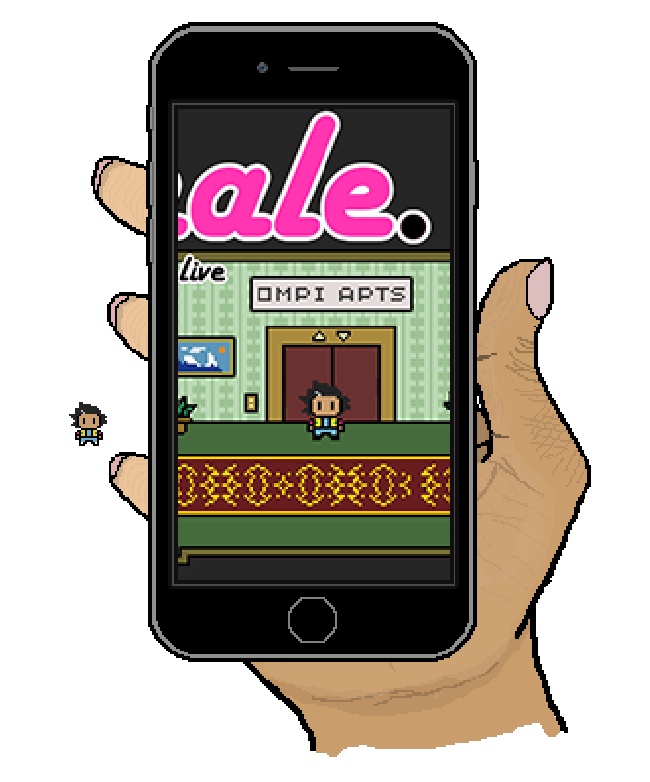 The other thing I wanted to share was my original menu concept, I figured Tris would pull out his mobile phone and you could save your game using "the cloud" and look through your contacts, although I don't have experience animating pixel pieces this huge or human anatomy in general so we'll see if I can successful animate the hand turning, I think it would look really neat! Hope to have a new build to share next week!